Anyone with more than one Mac—a desktop at the office and a laptop for traveling, for example—can appreciate the convenience of having the same set of contacts, calendar events, and e-mail accounts on the two machines. Unfortunately, setting this up isn’t always easy. Tiger’s .Mac Sync tool—which combines the .Mac online service and OSX’s systemwide Sync services—can simplify the process of staying synchronized. But it requires a .Mac membership, it can’t synchronize e-mail messages, and support for it in non-Apple apps is spotty. If you don’t have a .Mac membership (and don’t want one), if you want to synchronize messages, or if your apps don’t support .Mac Sync, syncing isn’t quite so simple—but it can still be done. Address Book, iCal, and Mail are nicely supported by .Mac Sync. Microsoft recently added support for Sync services to Entourage 2004’s calendar, address book, notes, and tasks—that support doesn’t extend to e-mail, though. To set up .Mac Sync, open the .Mac preference pane on one of your computers and make sure your member name and password are in the Account tab. Then click on the Sync tab (see “A Syncing Feeling”), and select the Synchronize With .Mac option. For now, choose Automatically from the pop-up menu; you can change the frequency later if you want—or synchronize manually at any time. Select the information you want to sync: Calendars and Contacts (which include both Apple’s apps and Entourage); Mail Accounts; Mail Rules, Signatures, and Smart Mailboxes; or Entourage Notes. (For the purposes of this article, I’m ignoring Bookmarks, Keychains, and any other application-specific data.) Click on Sync Now to let OS X copy all this data to the .Mac servers. 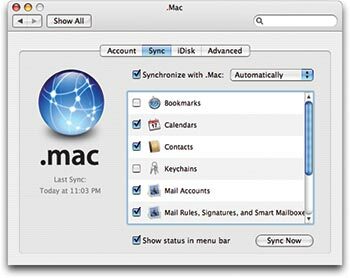 A Syncing Feeling The .Mac preference pane is where you tell OS X to keep your Address Book, calendars, Mail settings, and other data synchronized between multiple Macs. Both of your machines will now have identical copies of your data. If you specify automatic syncing, the two machines should both update their data at least hourly (as long as they’re on, awake, and connected to the Internet). Before you leave for your trip, though, be sure to sync the data manually, first on your desktop computer and then on your laptop, by clicking on the Sync Now button in the menu bar. Apple has made Mac-to-Mac synchronizing available only to .Mac members. But thanks to MildMannered Industries’ MySync software, you can use Apple’s syncing engine to synchronize two or more networked computers, without .Mac. After downloading and installing MySync (which is still a public beta program) on each machine, you designate one machine as the master (meaning that it serves as the central repository for your data) and all others as slaves. You then launch MySync on each computer, and select the options for the data types you want to sync (see “Another Way to Sync”). Click on Sync Now on each slave machine to synchronize it with the master. 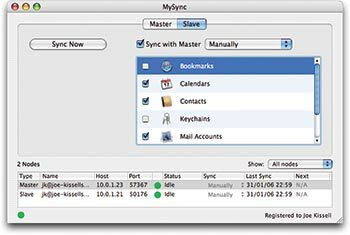 Another Way to Sync If you want to sync data between two or more Macs but don’t have a .Mac account, MySync lets you do it. Neither Tiger’s built-in sync feature nor MySync provides a way to synchronize e-mail messages. If you store all your e-mail on a server (using an IMAP, .Mac, or Exchange account), your mail already automatically stays in sync on your various machines. But what if you use POP e-mail and store your messages in mailboxes stored on your Macs? You can still sync your e-mail messages under those circumstances, but it takes some doing. And, because it’s a one-way sync that copies all the messages in your chosen mailboxes on one computer to another—and overwrites those mailboxes on the target computer—it can be risky. So proceed carefully. If you use Mail, first follow the preceding steps to synchronize your Mail accounts; then quit the application on both computers. Connect the two computers via AirPort or a physical Ethernet connection. Turn on Personal File Sharing in the Sharing preference pane on your desktop Mac (assuming that’s the machine holding your most up-to-date mail). On your laptop, choose Go: Network, select the desktop, and log in. Open two Finder windows side by side in List view. In one window, navigate to your user folder /Library/Mail on your desktop system; in the other, navigate to the same folder on the laptop. In the desktop Mac’s window, look for the folder of the POP account you want to synchronize; it should have a name like POP- nameaddress.com. Now look for a folder with the same name on your laptop. If you find it, simply copy the folder from the desktop machine to the laptop, overwriting the folder on the latter. If not—and sometimes account folders get slightly different names on different machines—copy the entire contents of the desktop machine’s folder and then paste them into the laptop’s folder, overwriting the existing files. So far, you’ve copied the inbox for that account, as well as its Sent, Drafts, and Trash mailboxes. If you also want to copy other mailboxes, look in your user folder /Library/Mail/Mailboxes for the folders you want. Copy those folders from the desktop to the laptop, overwriting what’s already there if necessary. Then launch Mail on your laptop. Select the inbox for the account you just copied—it will be empty. Choose Mailbox: Rebuild to update Mail’s message index. Any messages that were in the inbox on the desktop machine should reappear. Rebuild each mailbox you copied. When you return from a trip, repeat this process—but instead use the laptop as the source and the desktop as the destination. Even with its new support for Sync services, Entourage 2004 can’t synchronize e-mail messages between computers. Fortunately, because of the way Entourage stores data, copying all your messages from one machine to another is easy—and as a bonus, you get all your contacts and calendar items at the same time. But remember that this is a one-way, all-or-nothing sync; if you have any Entourage data on the target machine that isn’t on the source machine, this procedure will delete it. Quit Entourage on both machines, and follow the preceding instructions for sharing one computer’s hard disk and mounting it on the other computer. Then copy your user folder /Documents/Microsoft User Data/Office 2004 Identities/Main Identity from the desktop Mac to the corresponding location on the laptop, overwriting the existing folder if necessary. (If you have more than one Office 2004 identity, copy the folder with the identity whose data you want to use.) That’s it—no rebuilding or other magic required. Launch Entourage on the laptop, and it will display the data you had on the desktop Mac. When you return from a trip, reverse the procedure to copy the Main Identity folder from the laptop to the desktop. Each major release of OS X makes syncing a bit easier, and third-party programs are catching up rapidly. But until we reach the point when syncing all your data, no matter where it resides, is one-click simple, these procedures can help you keep your most crucial data at your fingertips, whether you’re at home or on the road.